About Aishwarya Goat Farm | Devgaon. 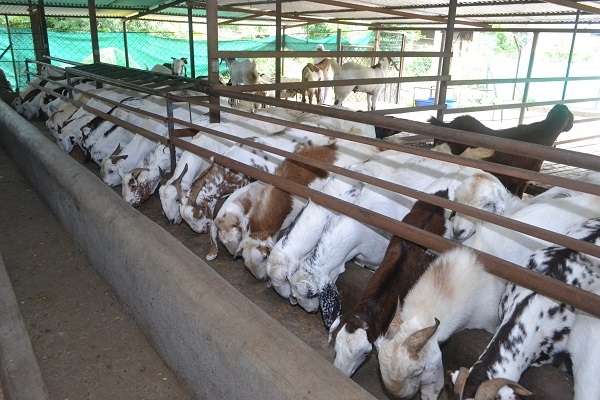 Established in 2012, Aishwarya Goat Farm is based in Maharashtra (India). We are among the leading Manufacturers and Suppliers of fine quality Livestock Bucks in Maharashtra. We supply Shirohi, Boer,Sirohi,Jamunapari and Sojat Male Bucks at competitive rates. We provide only well fed and healthy bucks to customers. We have dedicated staffs, who work towards ensuring our bucks’ good health. Our staffs make sure that the bucks receive proper nutrition and they get the required vaccination. Through such practices, we see to it that our bucks remain immune against all kinds of diseases. Our stalls are well maintained and regular surveillance of our stalls by experts makes sure that we do not lack in any aspect in keeping a clean and a healthy environment for our bucks. The stalls, which our bucks inhabit, are quite spacious and well equipped. We supply only healthy and disease free bucks to customers. We take every necessary step to maintain our bucks’ health and we provide them regular medical treatments for the same. During seasons of the flu, we take extra care to keep our bucks unaffected by the flu. When we was start this business we has only 15 animals in my Farm Shed. In 2011 we Purchase some Female Goats and one Male Goat and made one small shed for this. After Reproduction of Goats, we sale that goats and We gets Money. that time was thinking this very good and profitable business. In 2013 we was change the strategy of that business. We was made big shed for Goats and start this business as a profesionaly. I have Doctor that way no any problem occured to starting this business as profesionaly. Now I am the successful business man in Goat Farming , Breeding and Trading and I thankful for that people who helps to make successful people.